NETEDIT is a graphical network editor for SUMO. 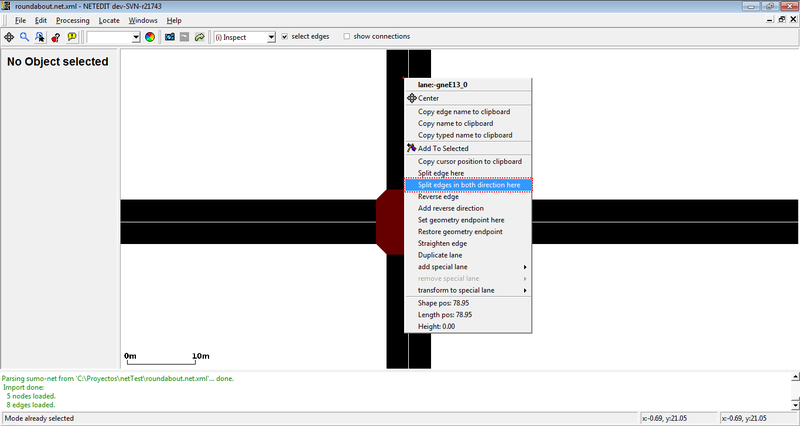 NETEDIT is a visual network editor. It can be used to create networks from scratch and to modify all aspects of existing networks. With a powerful selection and highlighting interface it can also be used to debug network attributes. 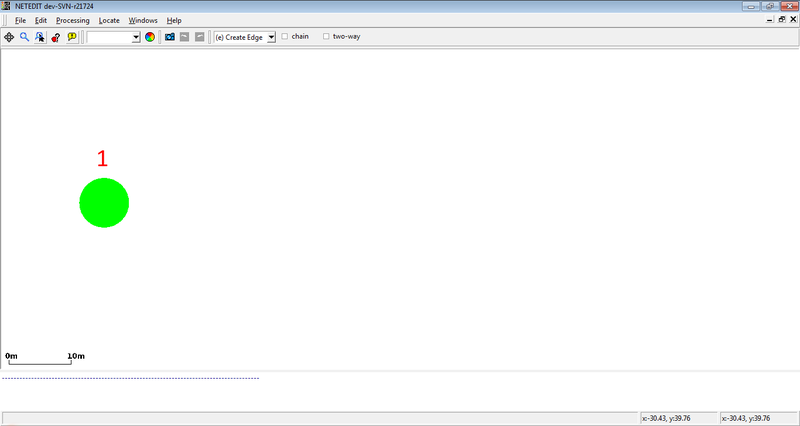 NETEDIT is built on top of NETCONVERT. As a general rule of thumb, anything NETCONVERT can do, NETEDIT can do as well. NETEDIT has unlimited undo/redo capabilities and thus allows editing mistakes to be quickly corrected. Editing commands are generally issued with a left-click (according to the current edit mode). 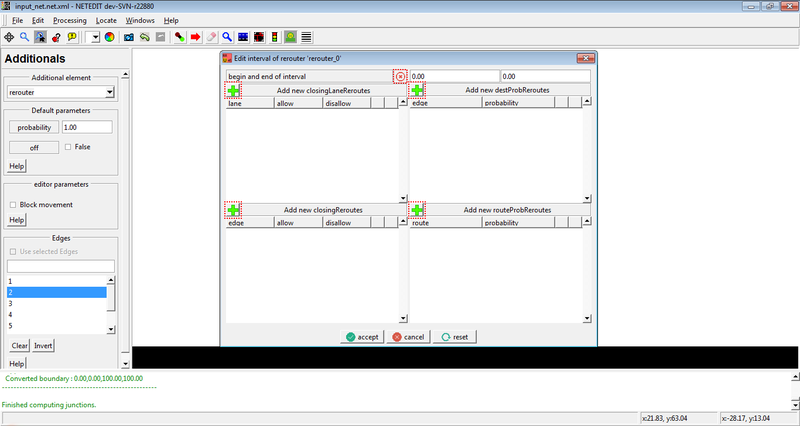 The user interface closely follows that of SUMO-GUI. Additional keyboard hotkeys are documented in the Help menu. Delete D Change to mode "Delete"
Inspect I Change to mode "Inspect"
Select S Change to mode "Select"
Move M Change to mode "Move"
Create Edge E Change to mode "Create Edge"
Connection C Change to mode "Connection"
Prohibition W Change to mode "Prohibition"
Traffic light T Change to mode "Traffic light"
Additional A Change to mode "Additional"
Crossing R Change to mode "Crossing"
POI-Poly P Change to mode "POI-Poly"
Create Route R Change to mode "Create Routes"
Create Vehicle V Change to mode "Create Vehicles"
Create Vehicle Type T Change to mode "Create Vehicle Type"
Create Stop A Change to mode "Create Stops"
In addition to these hotkeys, all hotkeys for moving and zooming in SUMO-GUI are supported. Compute Junctions (F5): recomputes the geometry and logic of all junctions. This is triggered automatically when entering modes which require this information (Connect, Traffic Lights). 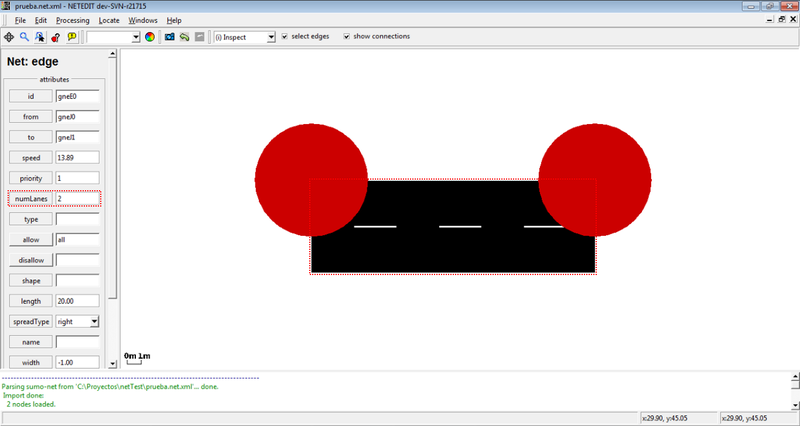 Clean Junctions (F6): removes all junctions that do not have any adjacent edges (These junctions are not included when saving the network. They are kept in the editor until cleaned for potential reuse). 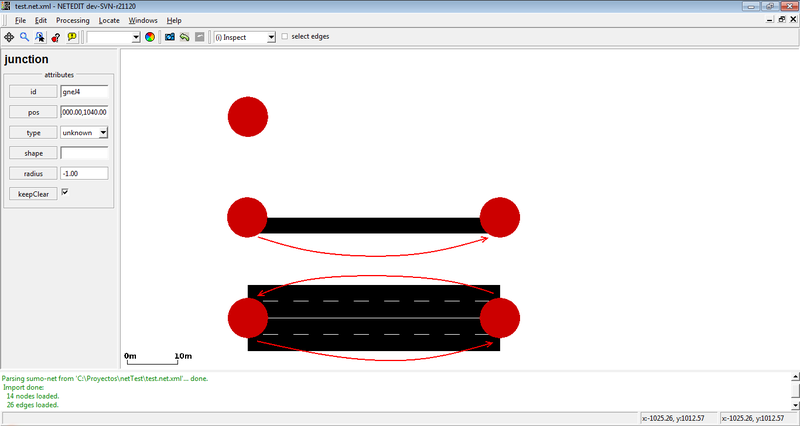 Join Selected Junctions (F7): joins the selected junctions into a single junction (See joining junctions). Options (F10): inspect and set all options. These are the same options that NETCONVERT accepts on the commandline or in a configuration. 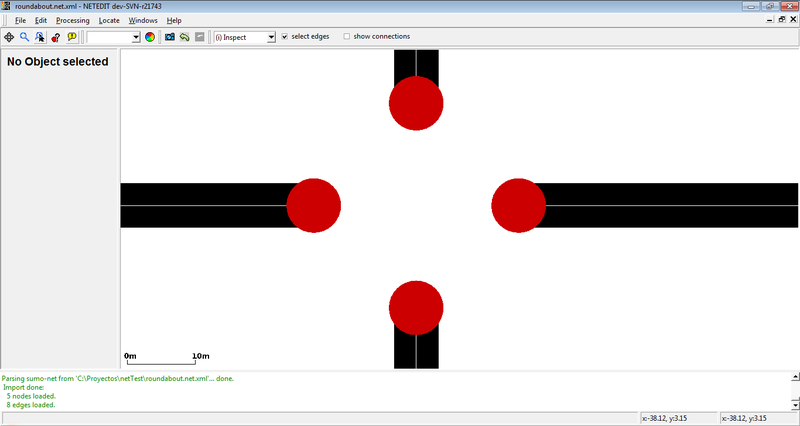 Most of the visualization options that are available in SUMO-GUI can also be set in NETEDIT. This includes the facilities for loading background images. 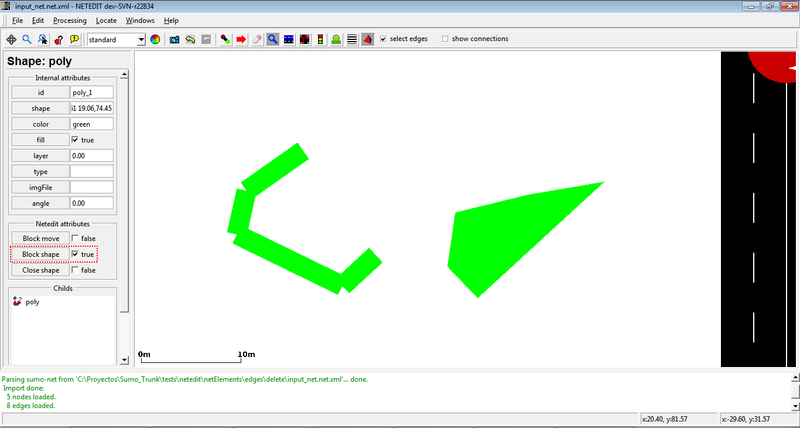 It is also possible to load POIs and Polygons using the menu File->Load Shapes. When activating the background grid via the visualization settings dialog or via the show grid option in Create Edge Mode, all clicks that create or move objects will snap to the nearest grid point. The resolution of the grid can be customized in the Background-Tab of the visualization settings dialog. 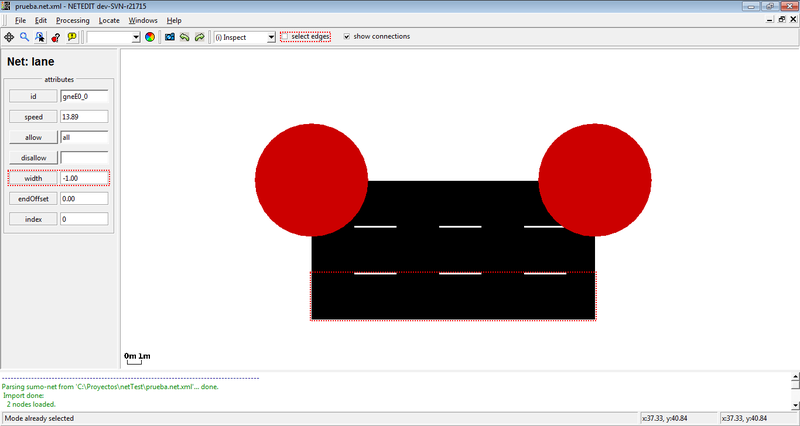 The main network elements that are used to represent a road network in SUMO are edges, lanes, junctions, connections, traffic lights. 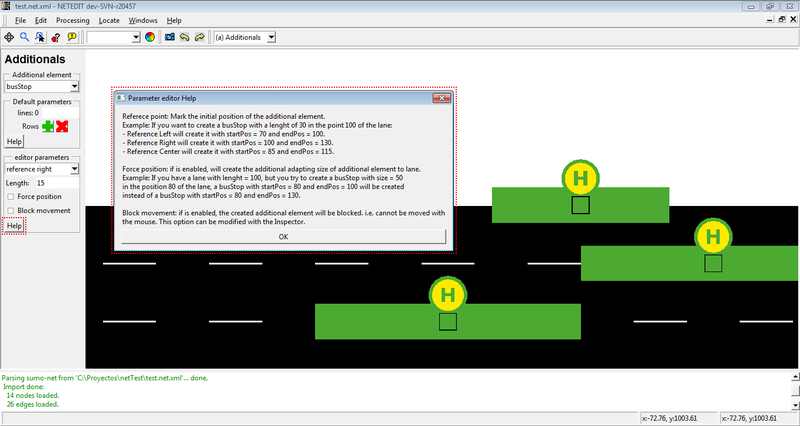 Additional infrastructure elements such as bus stops, detectors and variable speed signs are kept in separate files and loaded at the start of the simulation. In SUMO the terms node and junction and intersection are used interchangeably (in NETEDIT the term junction is used throughout). NETEDIT is controlled via various editing modes. This serves to reduce the number of clicks. For example, in Delete mode a click on any object deletes it. Edit modes are divided into two large sets (Supermodes), but with certain common modes. 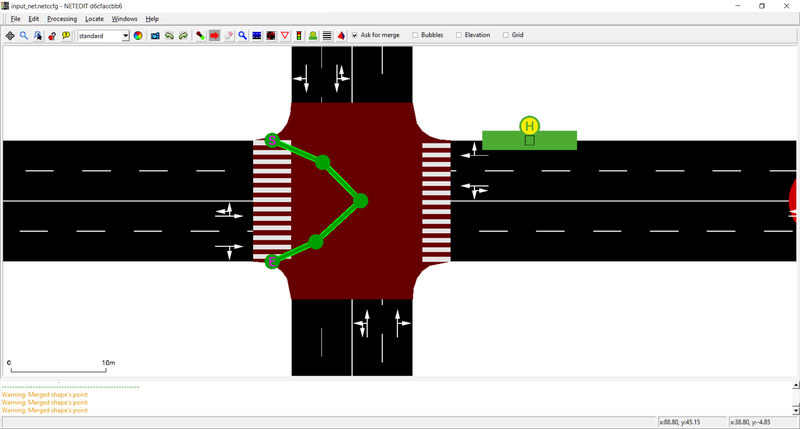 Supermode Network is specific to create and edit elements related to infrastructure, and Supermode Demand is specific to create and edit elements related to road traffic. Between both modes can be toggled either using the F3 and F4 keys or through the buttons located at the top of the window. 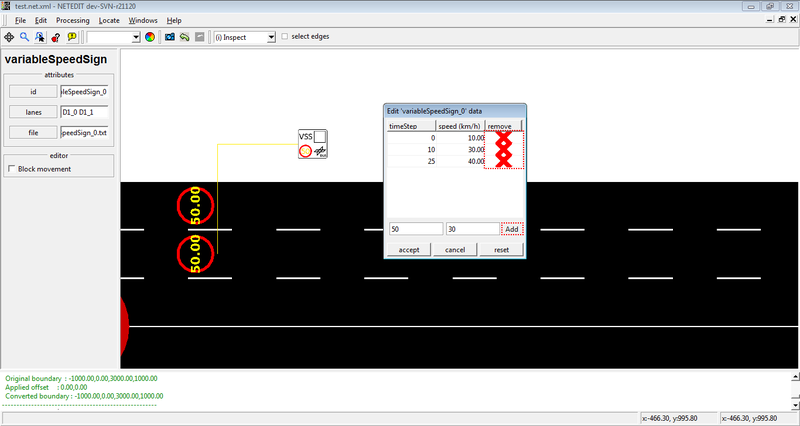 Inspect and modify attributes of edges, lanes, junctions, connections and additional network items (i.e. bus stops). Modifications have to be confirmed by hitting <Enter> (except for Boolean attributes). If the entered value is not appropriate for the modified attribute, the value will turn red to indicate the problem. 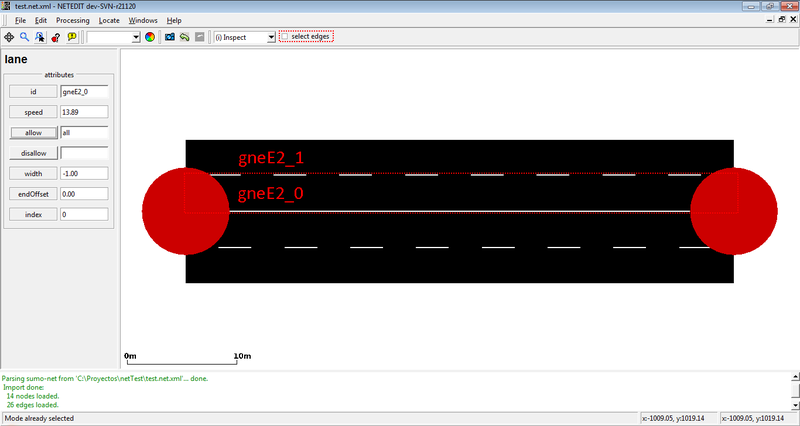 Changing the number of lanes of an edge. Changing the width of a lane. Note that option "select edges" is disabled. When inspecting an edge, the extra buttons set Edge ... as Template and Copy ... into edge ... appear in the inspection frame. These can be used to set default attributes for #Create_Edges and to copy attributes between edges. When copying attributes from one edge to another, lane-specific attributes will be copied as well. The delete frame own a list of elements that is filled automatically with the childs of the current element under the cursor. This list of child elements can be marked using Control + left-Click, and every child can be centered, inspected or removed individually with a right click over an element. Force deletion of additionals: Used to avoid undesirable deletion of additionals. If the user tries to remove an element with additional childs and 'Force deletion of additionals' is disabled, NETEDIT shows a warning dialog and the element isn't deleted. Select network objects according to various criteria. Selected objects can be moved or deleted together. 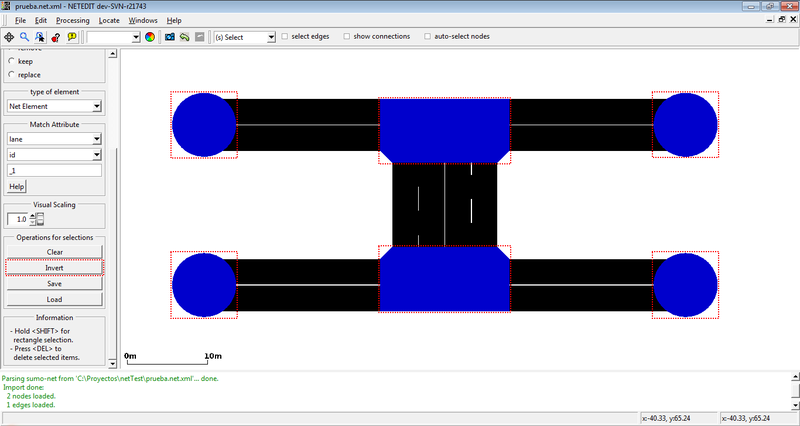 It is also possible to set attributes for all selected junctions (or all edges) at the same time using inspect mode. The left frame shows information about the current selected elements. Selected elements are painted with a different color. the selection status of objects is toggled by left-clicking. When the select edges check-box is unset, lanes, rather than edges will be selected/deselected. 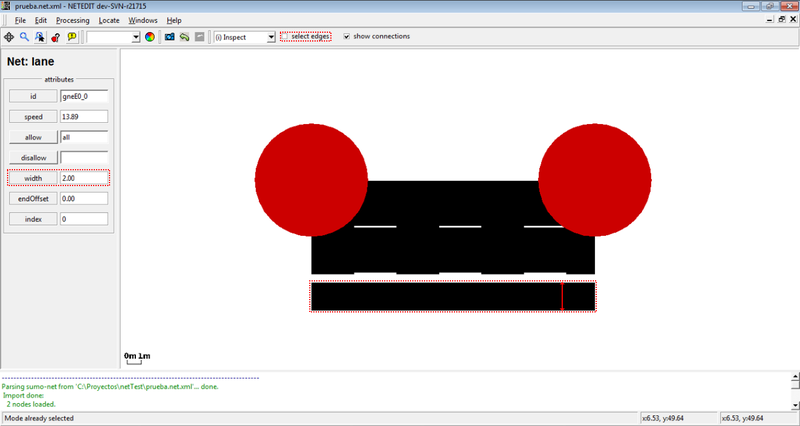 The 'Match Attribute' controls allow to specify a set of objects by matching their attributes agains a given expression. When combining this set with the current selection, the Modificatiton Mode is also applied. For numerical attributes the match expression must consist of a comparison operator ('<', '>', '=') and a number. For string attributes the match expression must consist of a comparison operator (, '=', '! ', '^') and a string. (no operator) matches if string is a substring of that object'ts attribute. '=' matches if string is an exact match. '!' matches if string is not a substring. '^' matches if string is not an exact match. For attributes allow and disallow, the attribute value all is shown in #Inspect-mode when all classes are allowed (or disallowed). In this case an edge (or lane) will also be selected when using any vClass as match string (and edge with attribute disallow="all" will also match when filtering for disallow with string passenger). However, for technical reasons the match string =all will not match this edge (all is expanded to all private emergency passenger bus ... custom1 custom2). We can do it selecting lane as type of element, and using the match over the attribute "id". Only two lanes are selected because the rest of edges only have one lane. 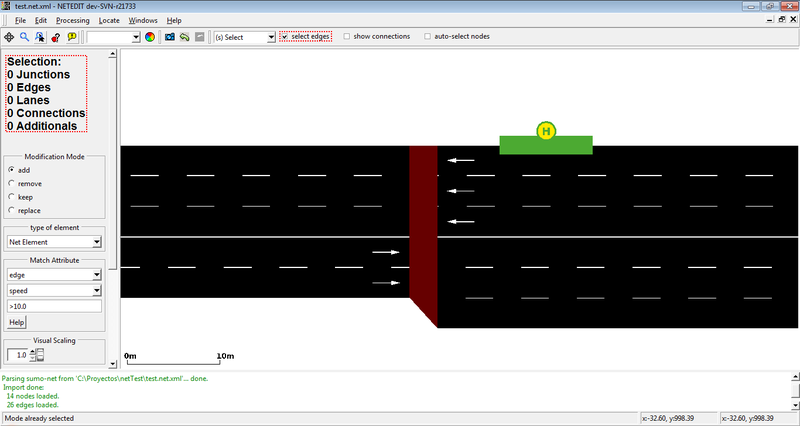 We can select all lanes of our net using the previous selection and the operator "add". 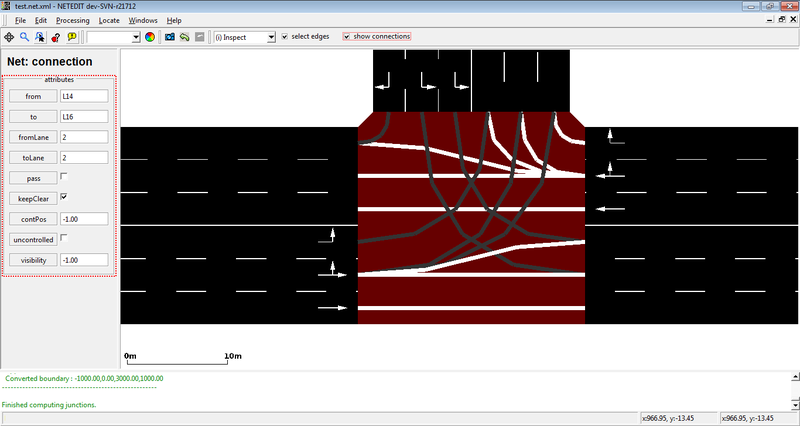 With the previous element and the operator invert, we can select all junctions of the network. If we have a empty selection, we can select easy all elements of net . With the invert button, we select all elements of net. 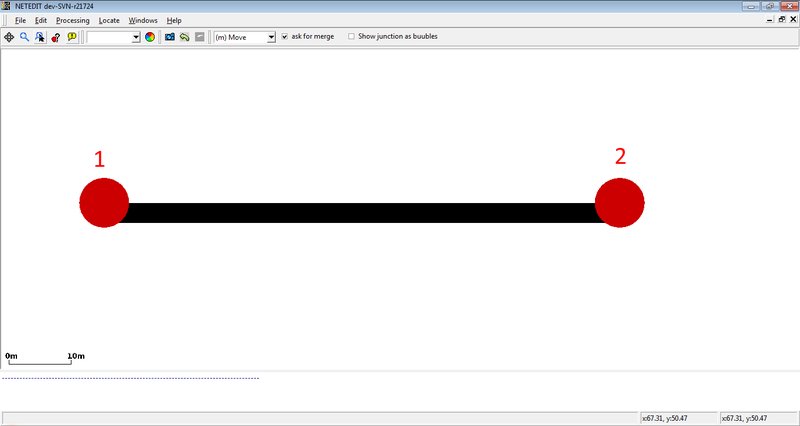 Move junctions by dragging with the left mouse button. 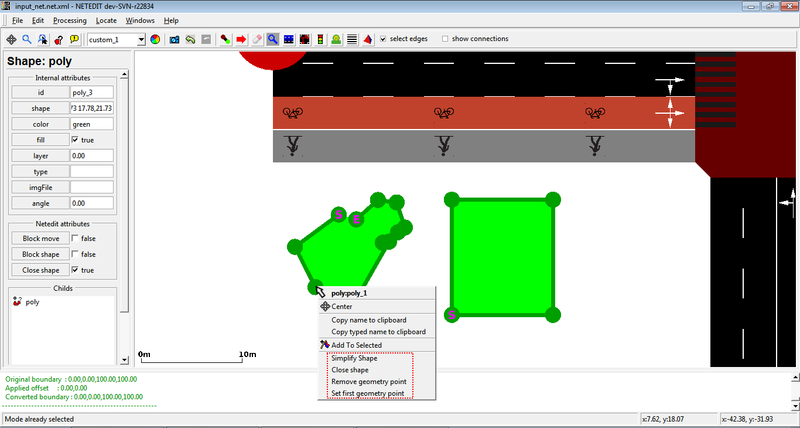 Dragging edges creates or moves geometry points. Dragging a junction on top of another junction joins them into a single junction. 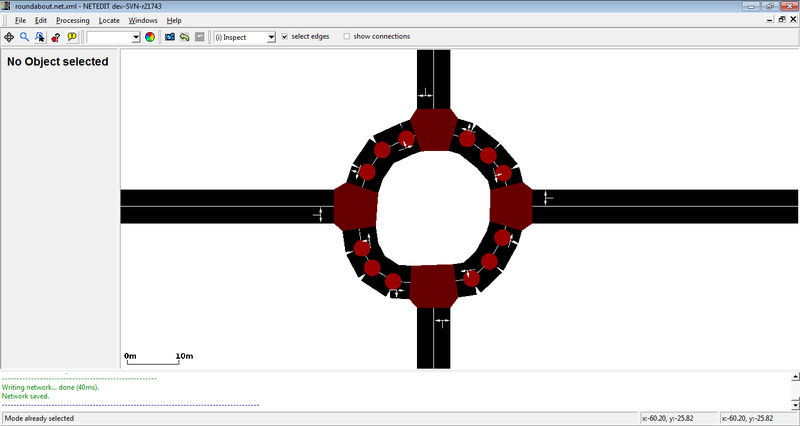 By default, the junction shape is updated while moving. However the final shape after saving or activating full recomputation (F5) may be slightly different. 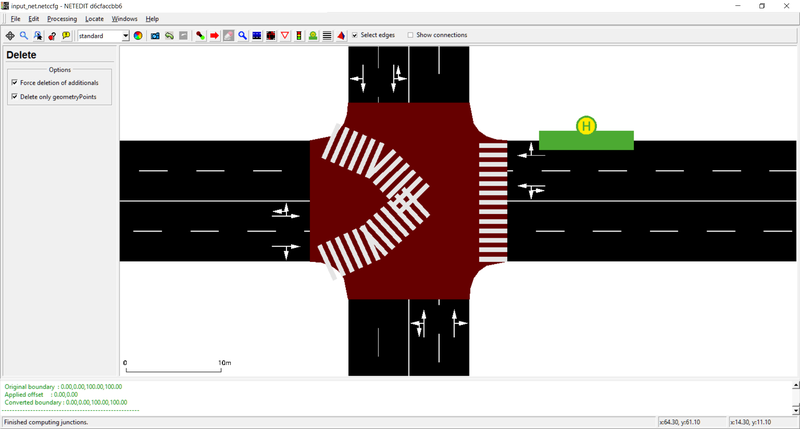 By setting the option "show junctions as bubbles", circles are drawn instead of detailed junction shapes which can improve visibility. This mode creates edges (lanes) and implicitly junctions. The edge attributes will be taken from the current #Edge_template. If no template is set, default options such as default.lanenumber will be used. 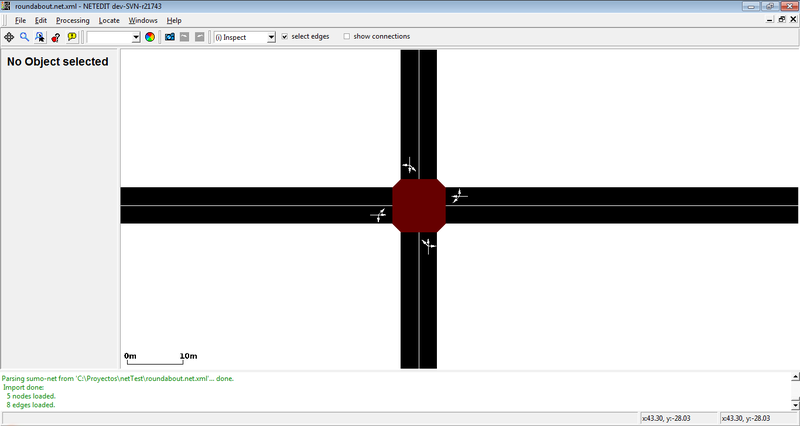 Then click in another empty area to create another junction. An edge with one lane between both junctions will be created. To connect two already created edges, click over the first junction. 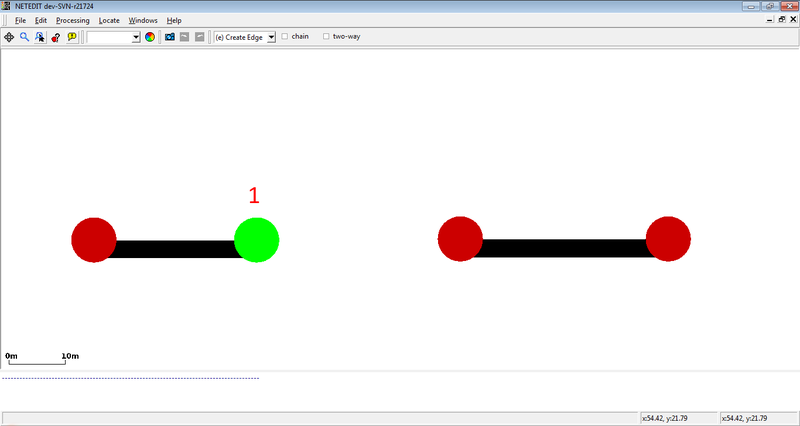 Click over the second junction to create an edge between both. A list of connected junctions can be quickly created by enabling the option chain. When setting the option two-way, the reverse direction for an edge will be created automatically (otherwise further clicks are needed to create the reverse direction manually). Connections establish the possible directions that can be taken by a vehicle when it arrives at a junction. Connections in a Junction with a bubble as shape. Connections in a Junction without a bubble as shape. As the rest of elements of netedit, connections can be inspected and modified using inspected mode. Note that the option show connections must be enabled. 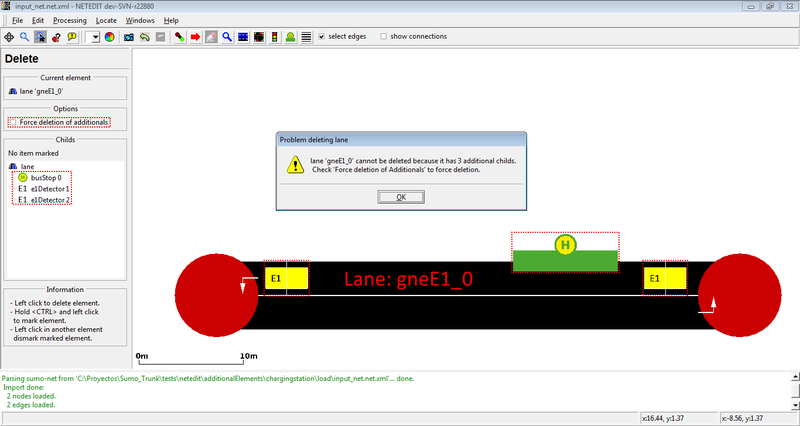 All parameters can be modified excepting From, To, fromLane and toLane. 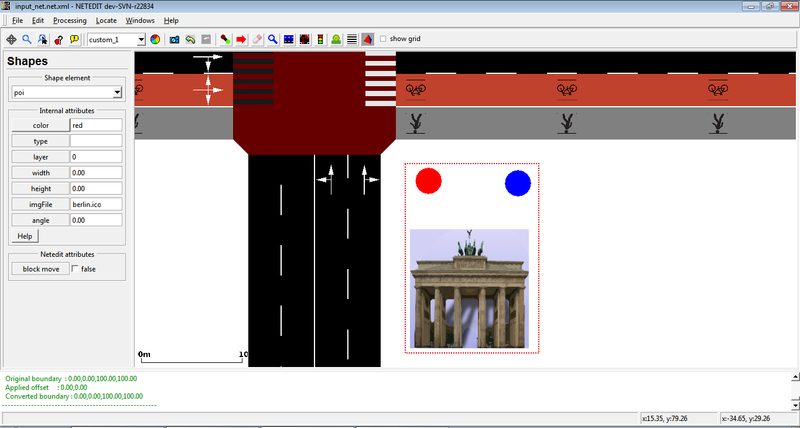 The connection coloring is done as in SUMO-GUI with the exception of traffic-light connections which are brown in inspect-mode. Inspecting a connection. Note that check box "Show connections" is enabled. Connections can be inspected through inspection of their from lane or it's corresponding edge. To deselect the source edge or cancel the declared connections press <ESC> or click the Cancel-Button. To confirm the change press <ENTER> or click the OK-Button. double connection. Usually each lane only has one predecessor from the same edge. A counter-example would be a zipper node. 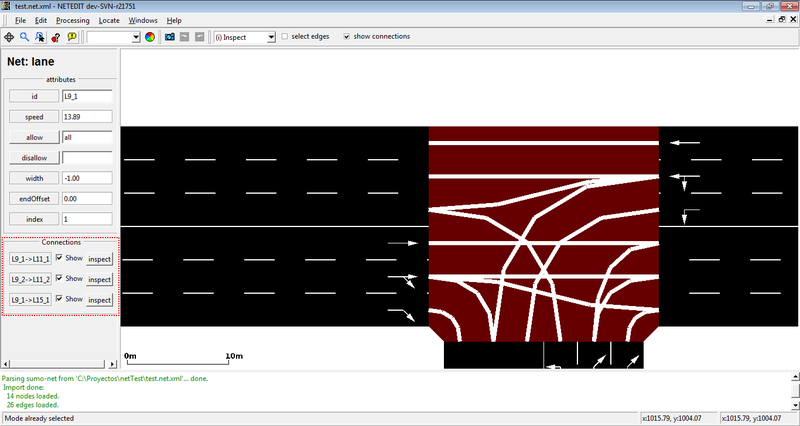 May also be useful to model bus bays. Connection from sidewalk: Lane-to-lane connections for pedestrians are usually not defined by the user. 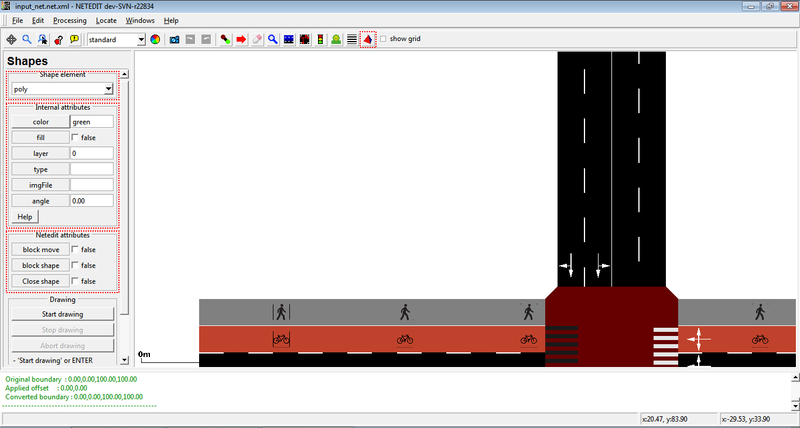 Instead, the connectivity is modeled with pedestrian crossings. Colors of the possible objective lanes change. In this example, the objective lanes are divided into Target Connected, Possible Target and Target Conflicted. 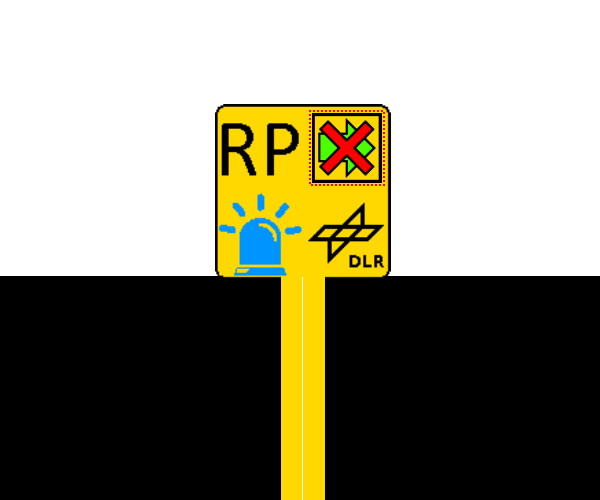 This mode shows right of way-rules for any selected connection using a color code. To select another connection, cancel the current one with <ESC>. right-clicking on any controlled lane and picking a new state (color). You can also change the state by editing the phase table directly. Add pedestrian crossings for use with pedestrian simulation. 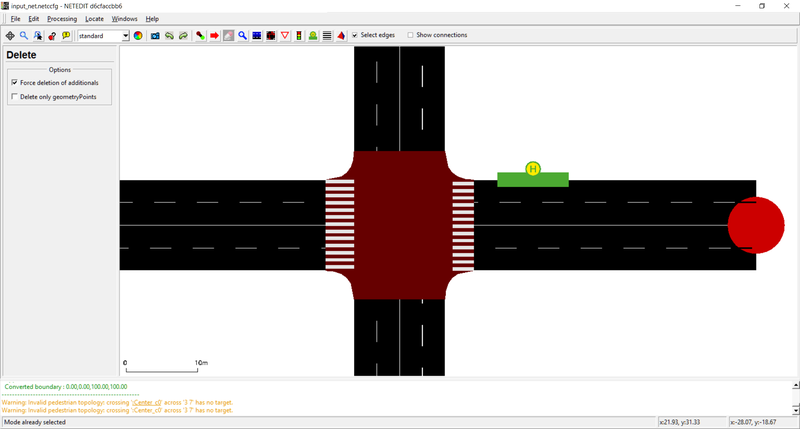 Crossings are define relative a junction and edges at this junction. Their width can be customized and they can either be configured as priotized (zebra stripes) or unprioritzed (vehicles have right of way). 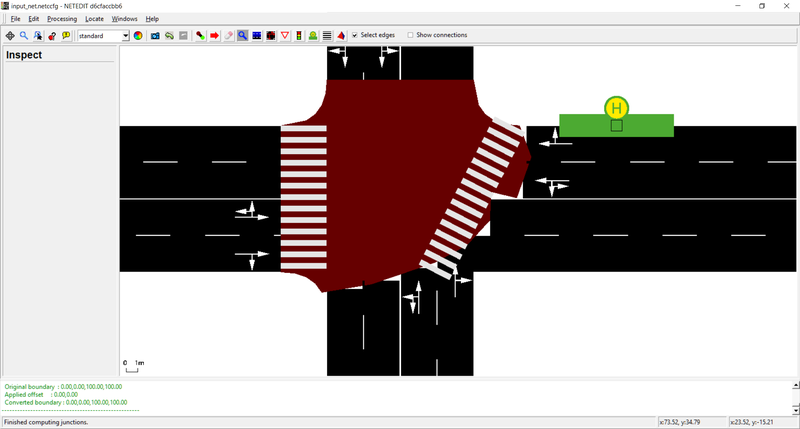 For crossings to be visible in NETEDIT, the Compoute Junctions (F5) functionality must be triggered at once. In crossing mode, first a junction must be selected. 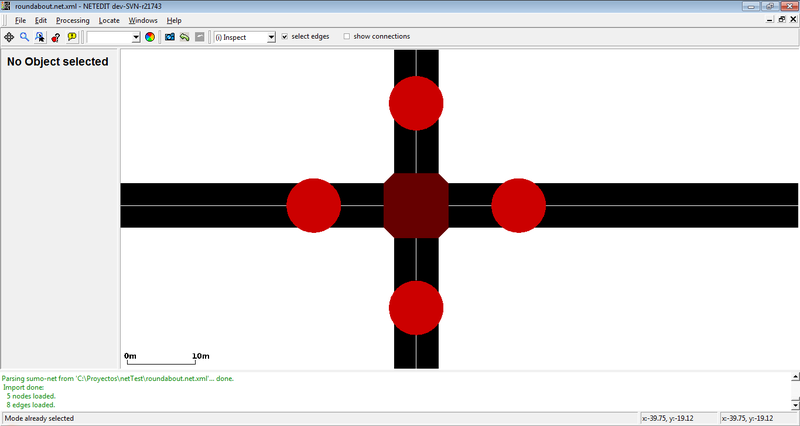 Click over junction's edges to select the edges of crossing. 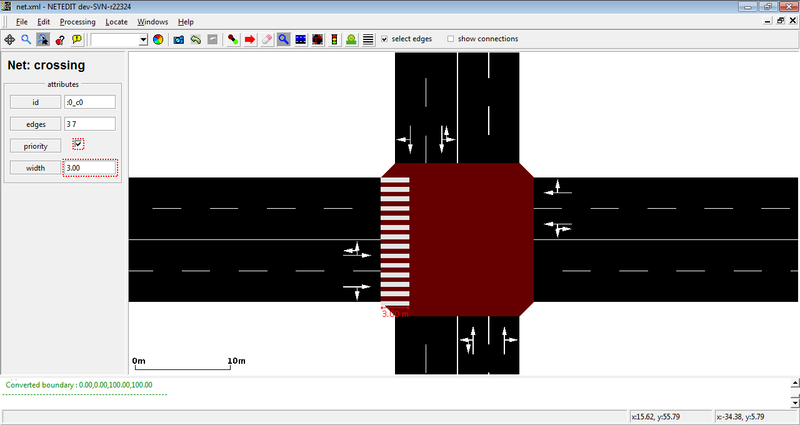 After click over "Create crossing" and recomputing (F5) the new crossing is visible. Crossing can be inspected as other elements. <lane id=":0_c0_0" index="0" allow="pedestrian" speed="1.00" length="13.10" width="3.00"
<lane id=":0_w1_0" index="0" allow="pedestrian" speed="1.00" length="13.10" width="3.00"
This mode allows creating and editing TAZ. (Shortcut Z). TAZs are composed of a closed polygon and a list of edges associated with certain weights for the inputs (Sources) and outputs (Sinks) (Similar to a Flow Network). 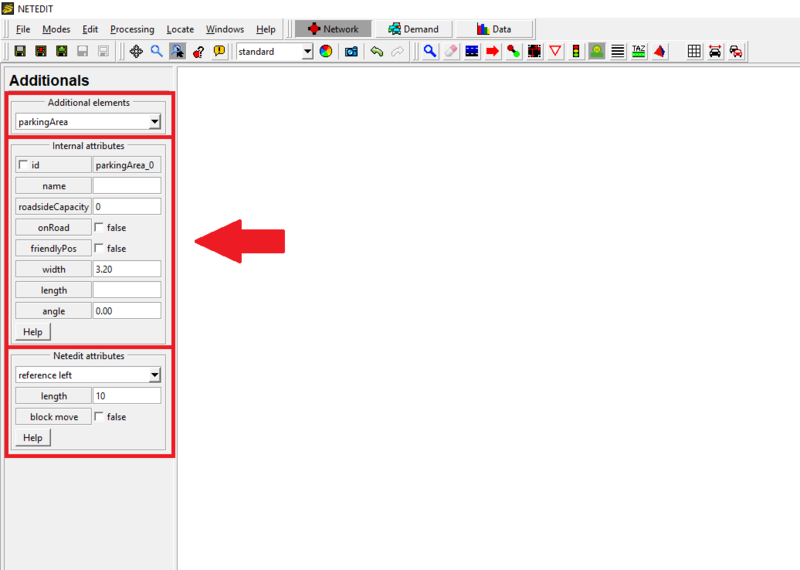 2) Definition of Edges and its inputs (sources) and outputs (sinks): A single click over a TAZ open the editing fields for TAZEdges in side menu. If the checkbox Membership is enabled (Toogle) box, a click over an edge will add it to the list of edges vinculated to the TAZ, (Or will be removed from the list if it was previously selected). Edge will will be added to the list with the input/output values given in the New source/New sink text fields. (note: A TAZ Edge always has a Source and a Sink). Selecting and editing TAZ Edges: If checkbox membership is changed to "keep", then TAZ Edges can be selected individually and their values changed. A multiple selection using a rectangle is possible with shift + right. Statistics of selected TAZEdges can be observed in "Selection Statistics"
Saving and discarding changes: All changes in TAZEdges has to be saved using button "Save Changes", or in the same way can be also discarded using "cancel changes" button. 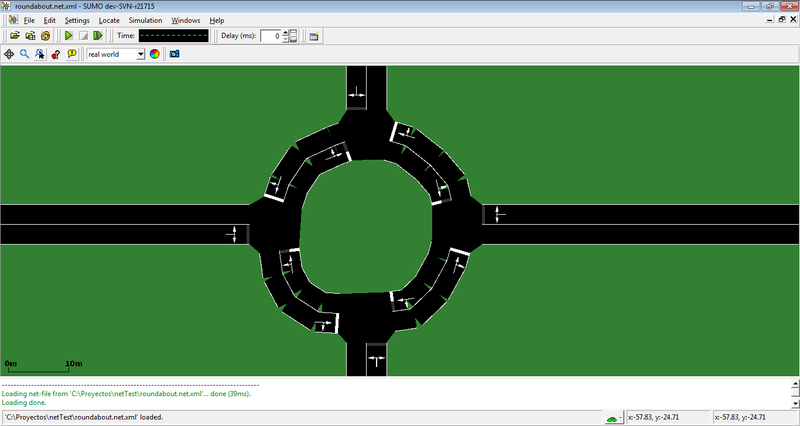 This mode allows the creation of Polygons and POIs (Points of Interest) through Polygon mode (hotkey ‘P’). These objects are used for visualization and can also be accessed via TraCI. 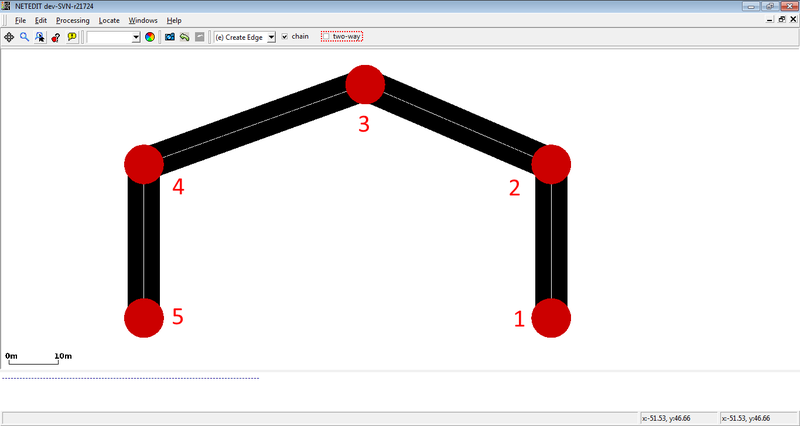 In the polygon frame you can select the type of shape to edit (Polygons or Point Of Interest), and the corresponding parameters for each one. General view of the shape frame. Color can be edited clicking over button "color". One polygon is composed of mainly an exterior line called “shape”. In order to create a shape, you have to click on the button “start drawing” (or enter key), and click on the View above each of the points that will form the shape. To end the edition, you have to click on “stop drawing”. 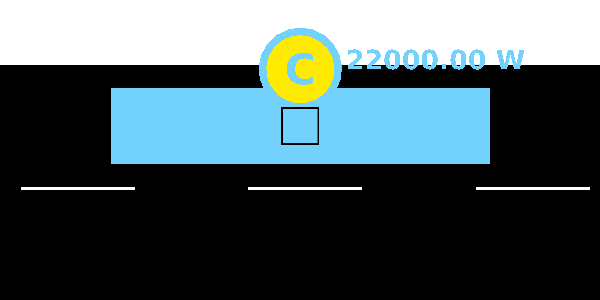 A right click on View will remove the last point created and the button “abort drawing” (or ESC key) will cancel the process of the creation of the shape. If you want to create a closed shape, you have to activate the option “closed shape” before starting to draw. 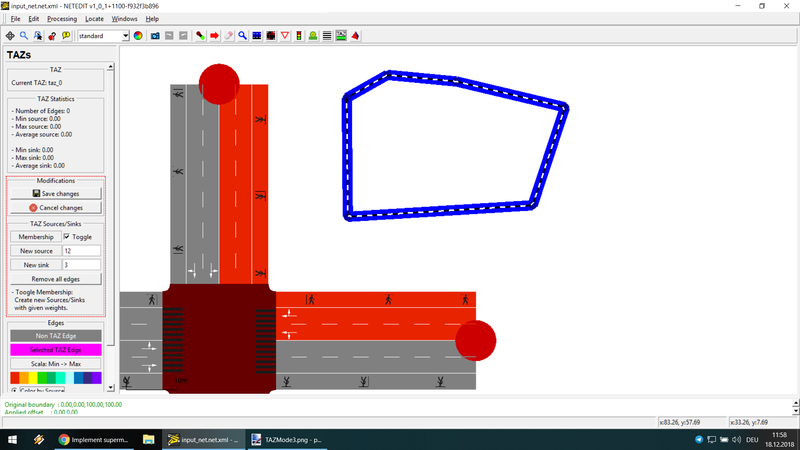 The shape of the polygon can be opened or closed with the contextual menu or through the Inspector mode. The points of a shape can be edited in the Move mode by clicking on the outline to create a new point or above an already existing one in order to modify its position. If a point moves to the same position of an adjacent point, they fuse together, and if the final point moves to the position of the initial point, the polygon gets closed. If the polygon has the option “block shape” activated, it won’t be editable, but only moved as a set. Besides, the contextual menu offers several options, like the aforementioned open or close shape, simplify the shape, erase a vertex of the shape and establish a vertex of the shape as the initial one. Contextual menu of polygon. Left click over verte show more options. The Points Of Interest (POIs) are the locations in the map used to mark several elements relevant to the simulation, which don’t interact with the rest of elements (monuments, special buildings, etc.). As default, they are represented as a colored point, but can also be depicted using an image. New route over the current infrastructure can be created using this mode. 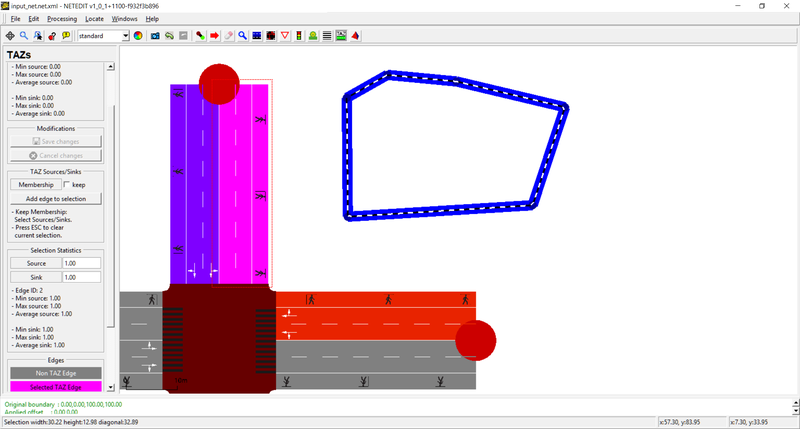 Routes are created clicking over consecutive edges (marked with different colors) and pressing "create route" button or Enter key. 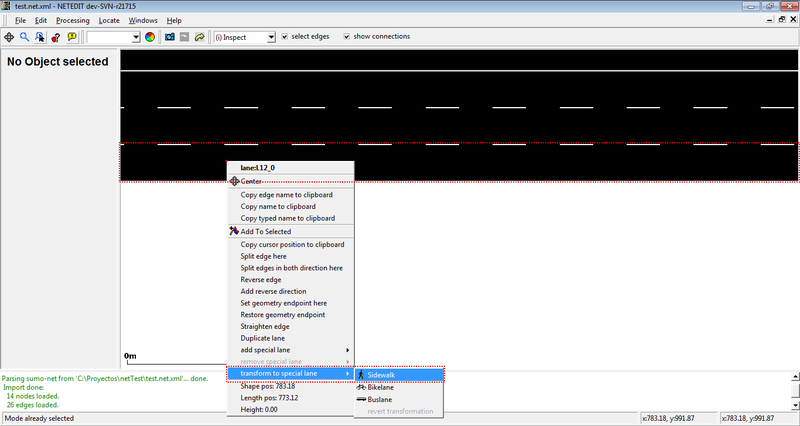 Route creation can be aborted using "abort creation" button or pressing ESC key. 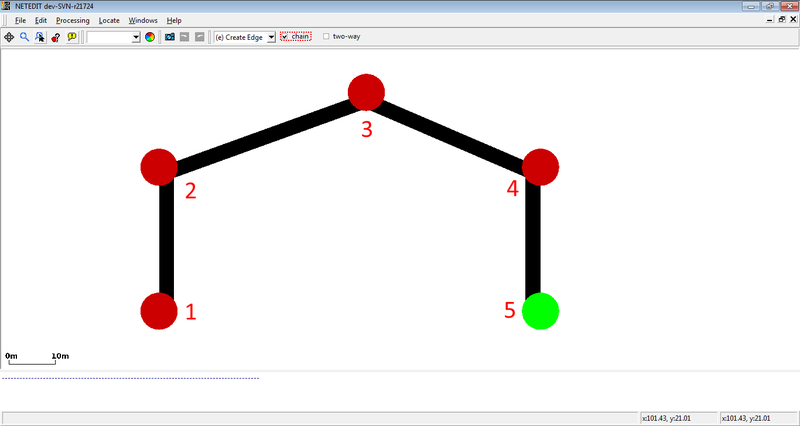 Note that Routes can be created between edges that aren't connected thought a connection. 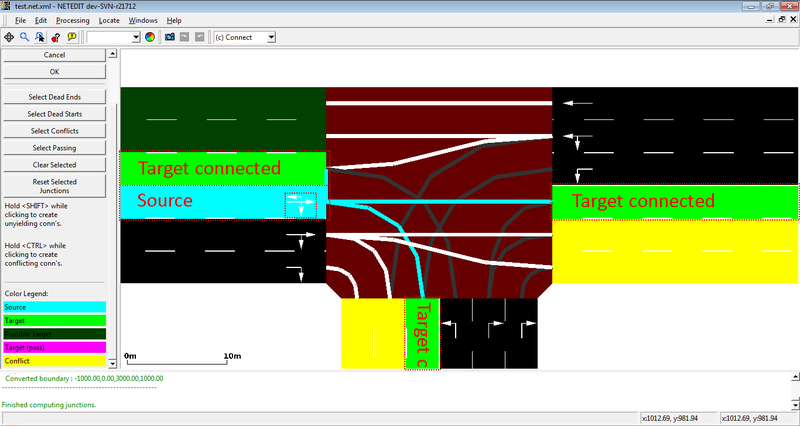 Vehicles, flows and trips can be created using this mode. The term "vehicle" includes three different elements: Vehicles, flows (both placed over a Route) and Trips (placed over a "from" edge). 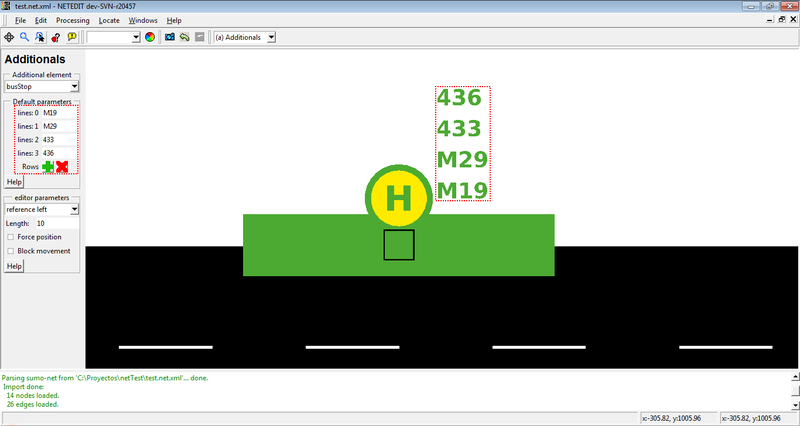 Also every vehicle need to be a "Vehicle Type", therefore both parameters has to be selected in both list of left frame. Creating a flow. It's similar to a vehicle, but with extra parameters, and note that certain are disjoint parameters. Inspecting a trip. 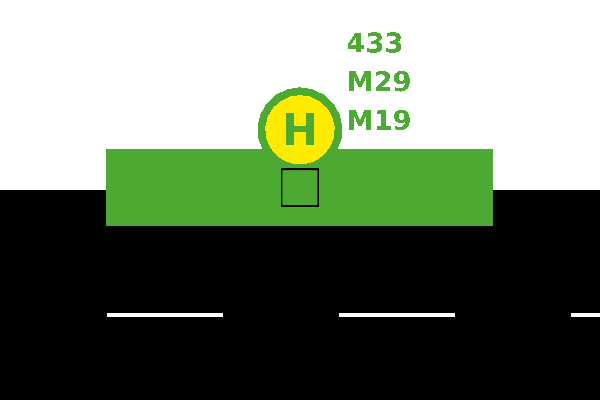 In this case the route is highlighted. Note that a change in the infrastructure can be change the route trip. Vehicle types can be created and edited using Vehicle Type mode. A vehicle Type isn't a visual element that can be observed in the view, but is an "abstract" element that have a big influence in other elements (for example, vehicles). 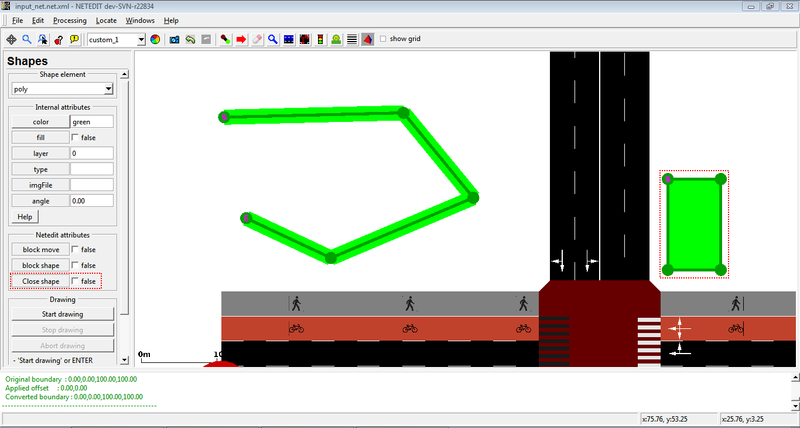 Every simulation has always three default vehicle types for Vehicles, Bikes and pedestrians. This default vehicle type can be edited but not deleted, and only is written in XML if one of their default value is modified. 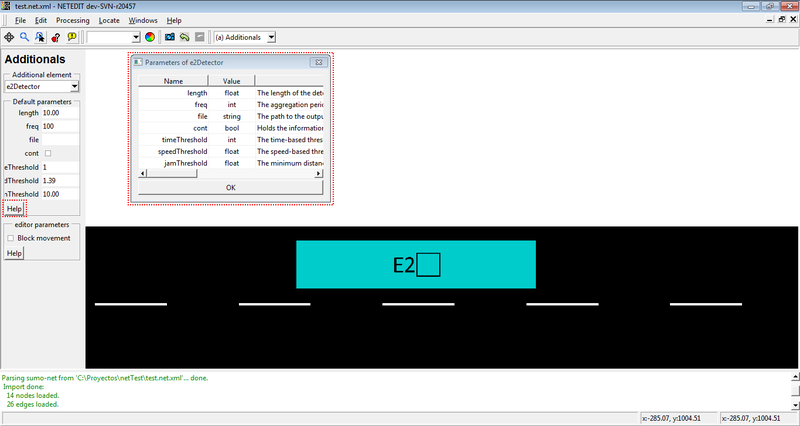 Due a Vehicle Type has a big number of parameters, only the most relevant parameters can be edited in left frame. To edit advanced parameters, use the Vehicle Type Dialog opened thought "Open attribute editor" button. Creating a new vehicle type. Note that non-default vehicle types can be deleted using "Delete Vehicle Type"
Editing values of a vehicle type using attribute editor. 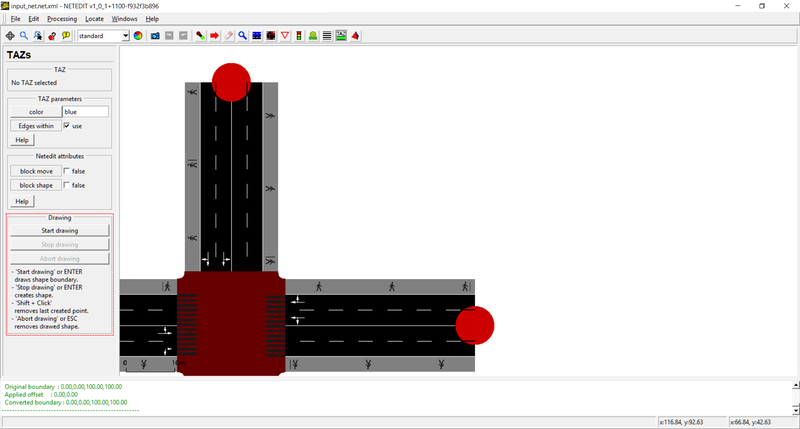 Stops used by all type of vehicles (Vehicles, Flows and Trips) can be created using StopFrame. 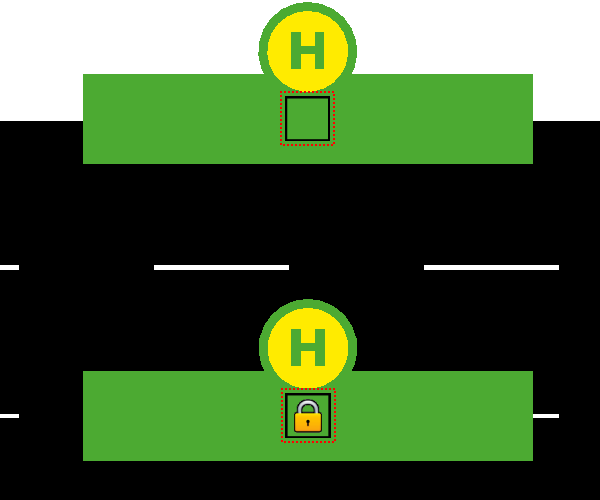 Stops is an special type of demand elements, because it always depend of either a route or a vehicle (i.e. It can be writted in XML within the definition of either a route or a vehicle). 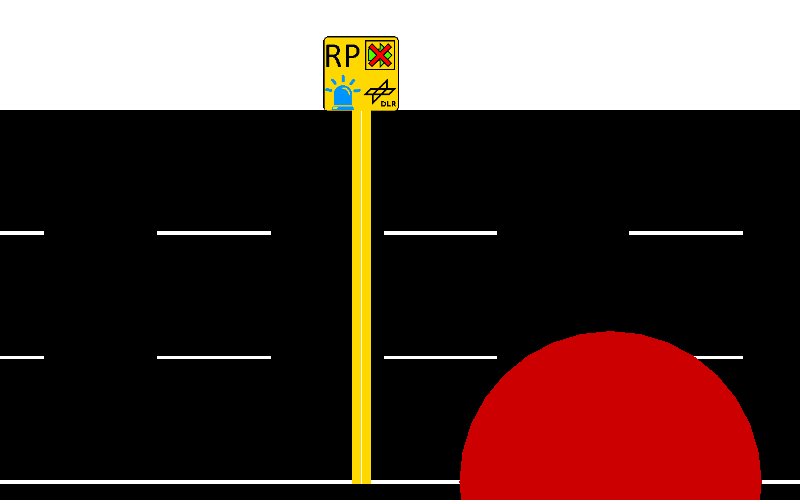 Before creating a new Stop, their demand element parent has to be selected and the stop type (placed over a Lane or over a stopping Place). To create it, simply click over a lane or over a stopping place. General view of Stop Mode. 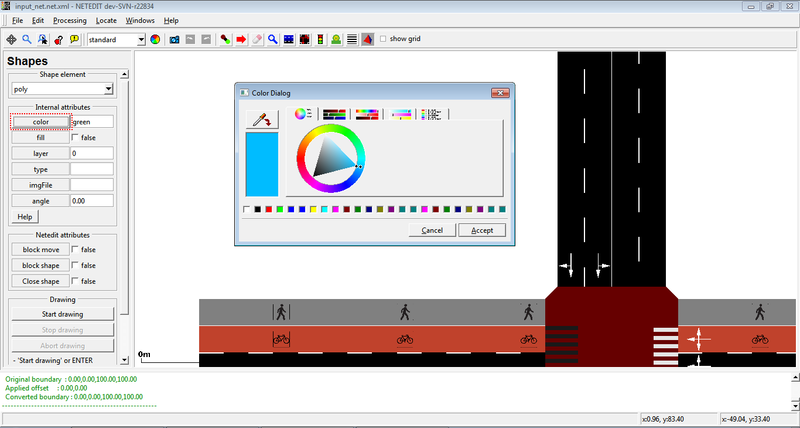 Route and stop type can be selected in frame. Created stop within the blue route placed over a lane. Created stop within the blue route placed over a busStop. If geometry of BusStop is changed, geometry of Stop will be also changed. Inspecting a Stop placed over a lane. Inspecting a Stop placed over a busStop. 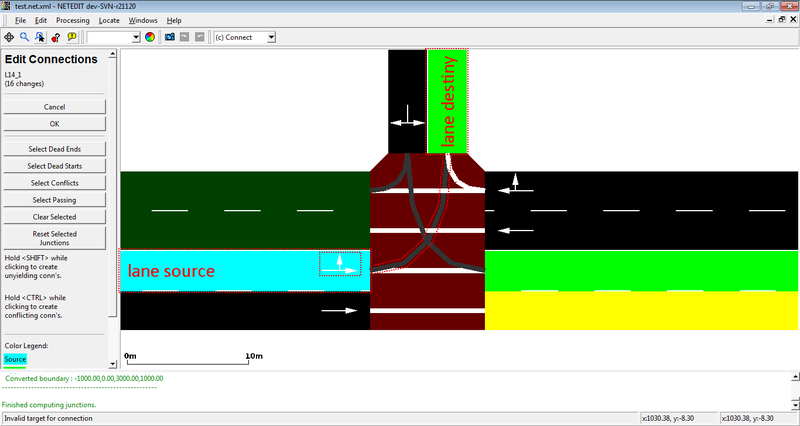 This elements comprise the road network and can be created and modified with NETEDIT. Junctions, (also referred to as Nodes), represent intersections. A SUMO junction is equivalent to a Vertex in graph theory. In the SUMO-context, edges represent roads or streets. Note that edges are unidirectional. It's equivalent to a edge in a graph theory. Each SUMO edge is composed of a set of lanes (At least one). 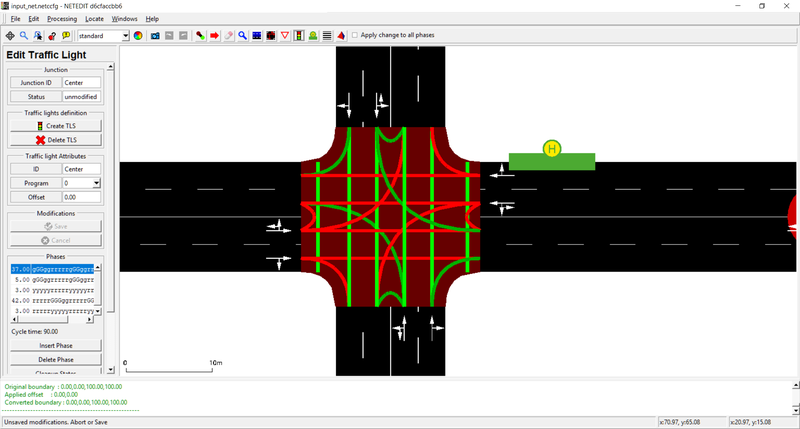 Connections describe how incoming and outgoing edges of junctions are connected (for example to prohibit left-turns at some junctions). A traffic light program defines the phases of a traffic light. Additionals are elements which do not belong to the network, but may be used to influence the simulation or generate specific outputs. Additionals are defined in an additional-file and can be loaded in NETEDIT. Additionals are created in the Additionals editing mode (shortcut key: a). Once this mode is selected, the first step is to choose what kind of additional should be created in the comboBox "additional element". Once selected and if required, the parameters of the additional can be changed. 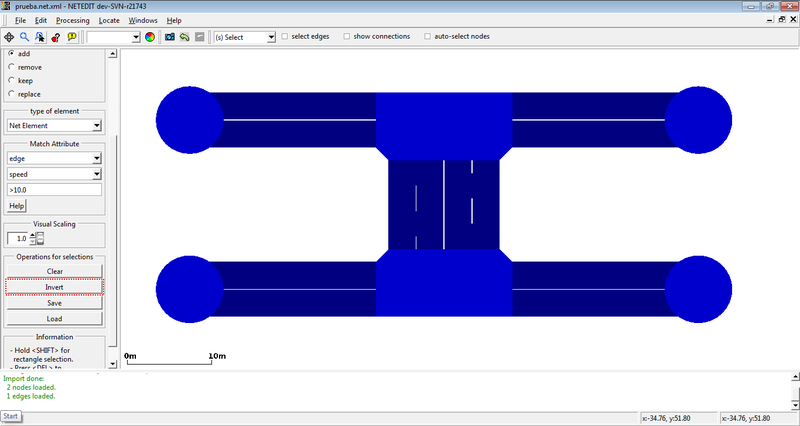 Finally, with a click over a Lane/junction/edge (If the additional should be set over an element of the network), or over an empty area (if the item is independent of the network) the additional will be created. 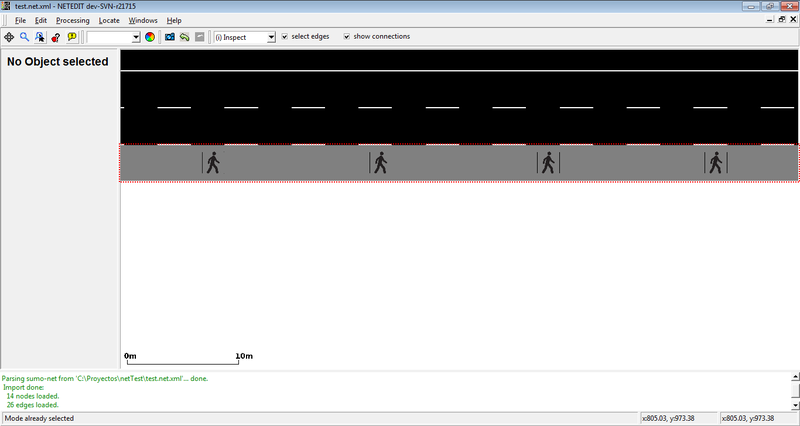 Reference left will create a new bus stop with startPos = 30 and endPos = 50. 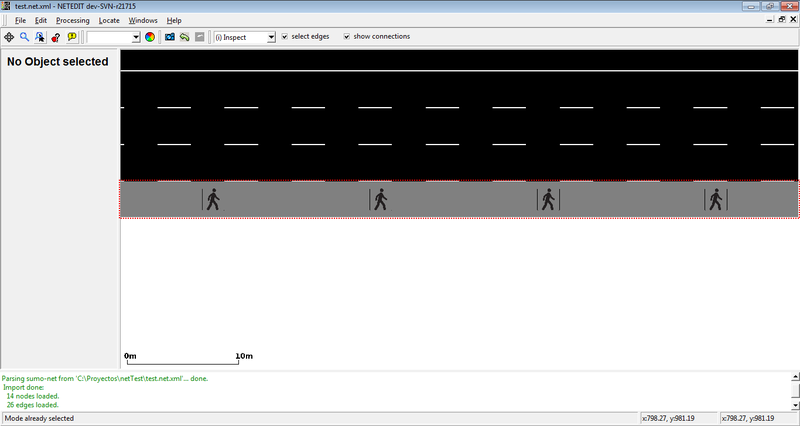 Reference right will create a new bus stop with startPos = 50 and endPos = 70. Reference center will create a new bus stop with startPos = 40 and endPos = 60. There are two types of parameters for each additional: User-defined-parameters and NETEDIT-parameters. The first mentioned parameters can be of type int, float, bool string, or list and each has a default value. In the case of type list the user can add or remove values using the add or remove row buttons. In the case of the characteristic parameters of NETEDIT, this is the option to block the movement of an element, and in the case of the elements have a length, the user is allowed to change the length and reference. Additional sets are additionals that comprise or contain another additionals (called childs) (For example, detectorE3 contains a list of detEntry and detExit). 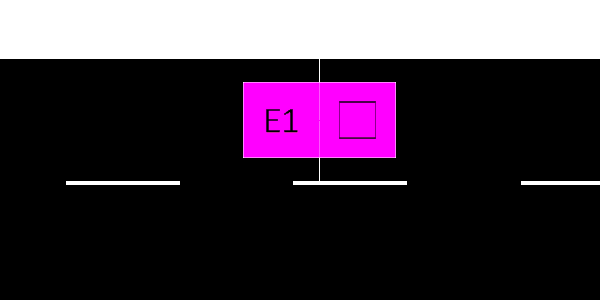 Additional sets are inserted in the same way as an Additional, but the insertion of an additional child is different. Before the insertion of an additional child in the map, the ID of the additionalSet parent must be selected in the list of IDs placed on the left frame. In this list the IDs of the additional sets only appear when they can be parents of the additional child (Referring to the given example: if the user wants to insert a detEntry, than only IDs of detectorE3 will appear in the list on the left frame). 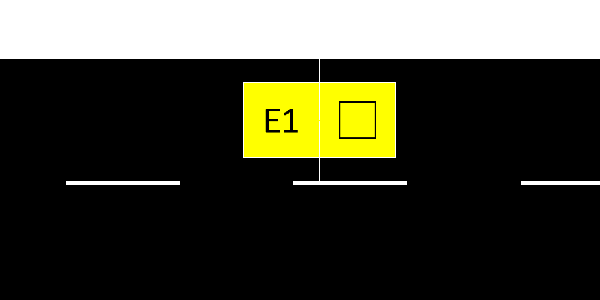 Additional sets and their childs are graphically connected by a yellow line. 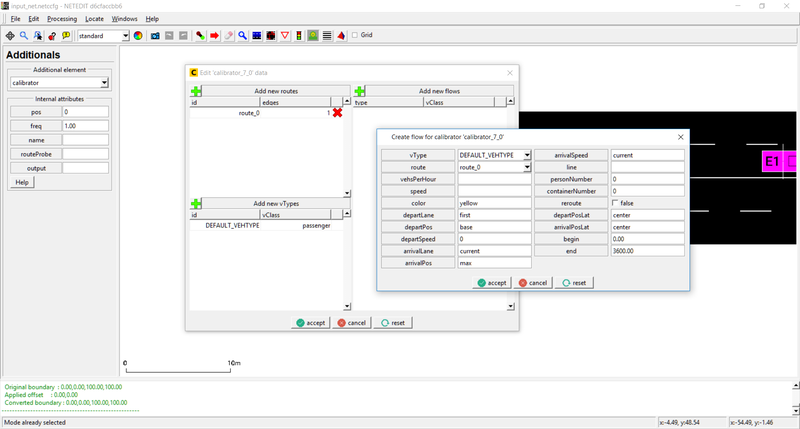 With the help buttons placed in the left frame, users can obtain information about additional and editor parameters (Full name, type and description). 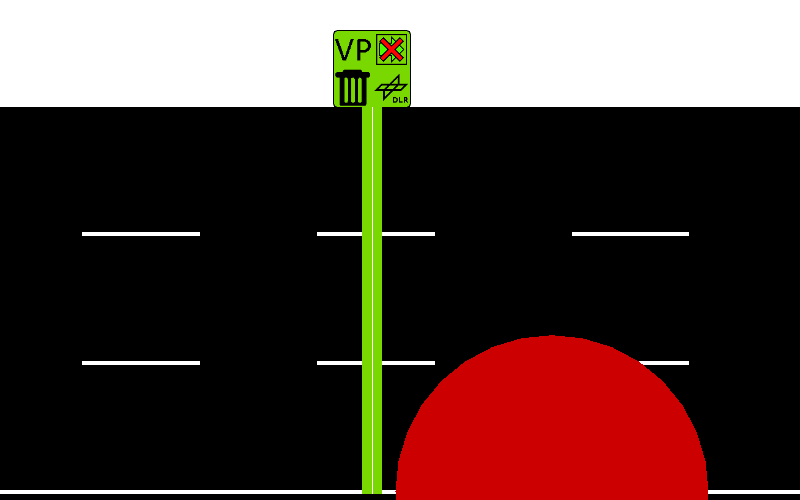 Stopping places are sections of lanes, in which vehicles can stop during a certain time defined by the user. 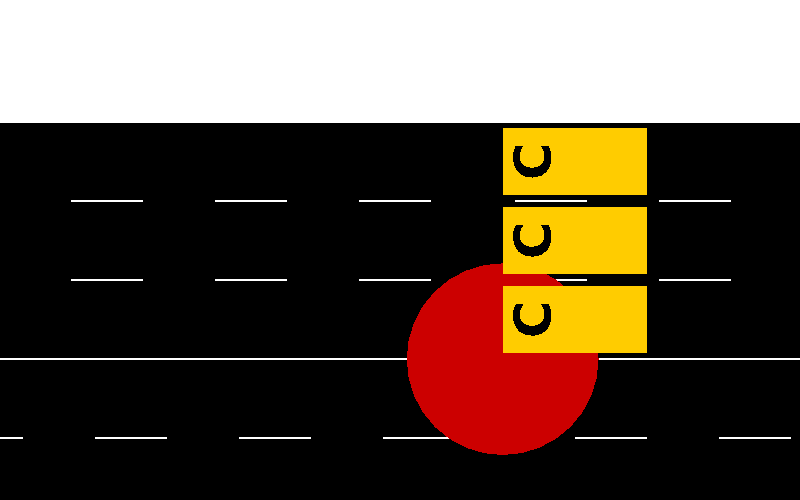 Bus stops are positions of a lane in which vehicles ("busses") stop for a pre-given time. Every Bus stop has an unique ID assigned automatically by NETEDIT, a length and a list of bus lines defined by the user. Container stops are similar to BusStops, but they are oriented towards logistics simulation. Charging stations define a surface over a lane in which the vehicles equipped with a battery are charged. Charging stations own an unique-ID generated by NETEDIT, a length, a charging power defined in W, a charging efficiency, a switch for enable or disable charge in transit, and a charge delay. 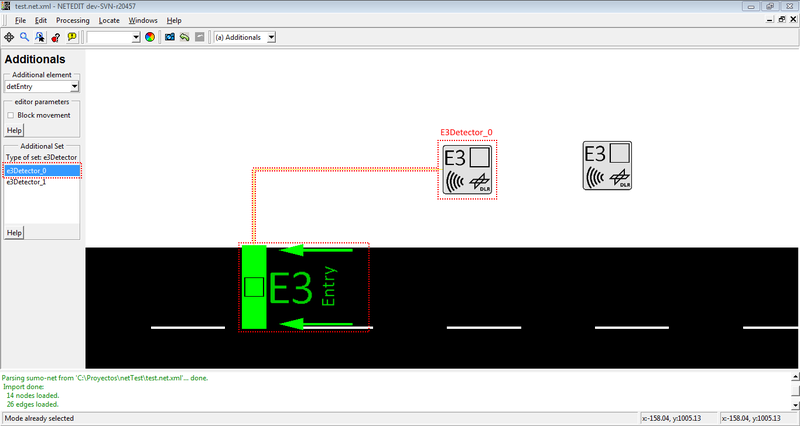 Detectors are additionals wich save information about vehicles that passed over a certain position on the lane. 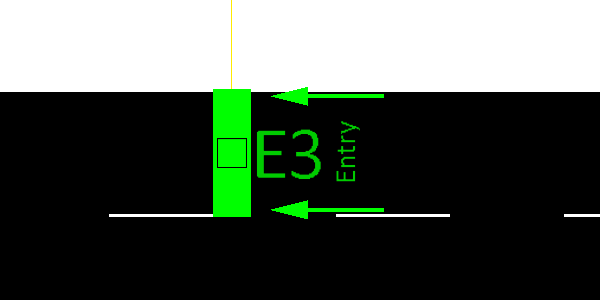 A E1 detector owns a ID parameter generated by NETEDIT, a position at a certain lane, a freq attribute which describes the period over which collected values shall be aggregated, a list of VTypes that will be detected, and a file attribute which tells the simulation to which file the detector shall write his results to. 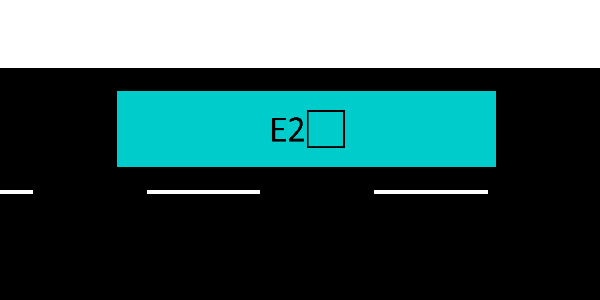 Most of the E2 detectors' attributes have the same meaning as for E1 induction loops, including automatic ID and position at a certain lane. As a real detector has a certain length, "length" must be supplied as a further parameter. It may be a negative number which let the detector be extended, upstream to the given start position. 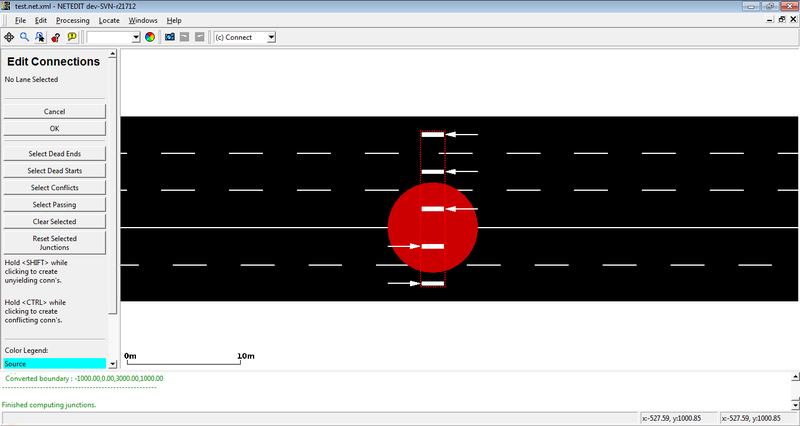 The optional parameter "cont" lets the detector continue over the current lane onto this lane's predecessors when the detector's length plus his position is larger than the place available on the lane. A Detector E3 is an AdditionalSet with the same attributes as Induction Loop Detector E1. 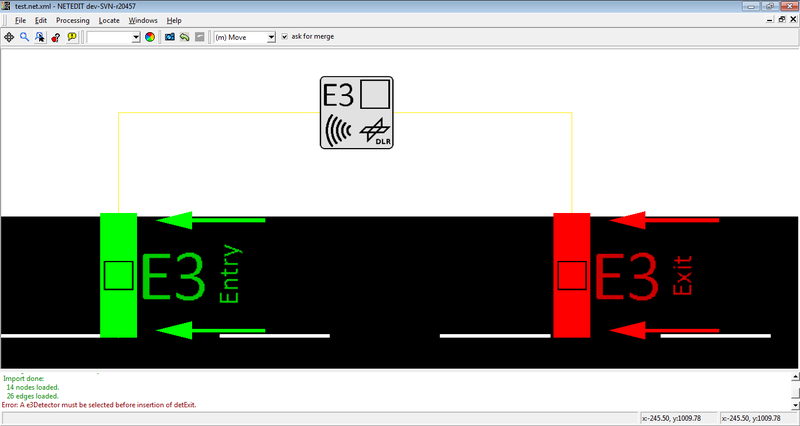 The difference is that detectors E3 have as childs the Entry/Exit detectors. 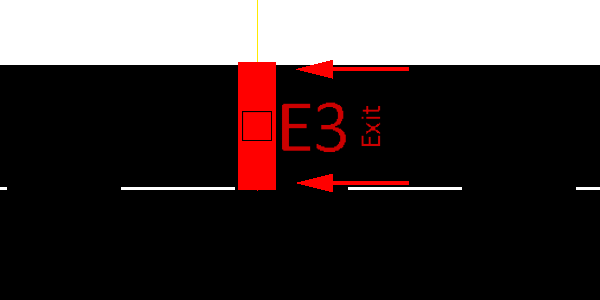 Childs of an AdditionalSet Multi-Entry Multi-Exit Detectors E3. These additionals have only the attributes ID of a lane in which it is placed and positioned over a lane. A E1 detector owns a ID parameter generated by NETEDIT, a position at a certain lane, a freq attribute which describes the period over which collected values shall be aggregated, a list of VTypes that will be detected and a file attribute which tells the simulation to which file the detector shall write his results to. 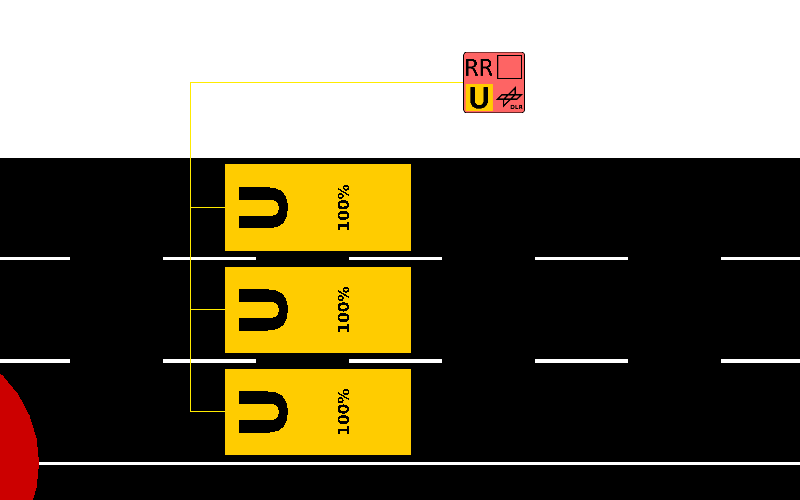 RouteProbe detectors are meant to determine the route distribution for all vehicles that passed an edge in a given interval. Their real-world equivalent would be a police stop with questionnaire or a look into the database of navigation providers such as TomTom. 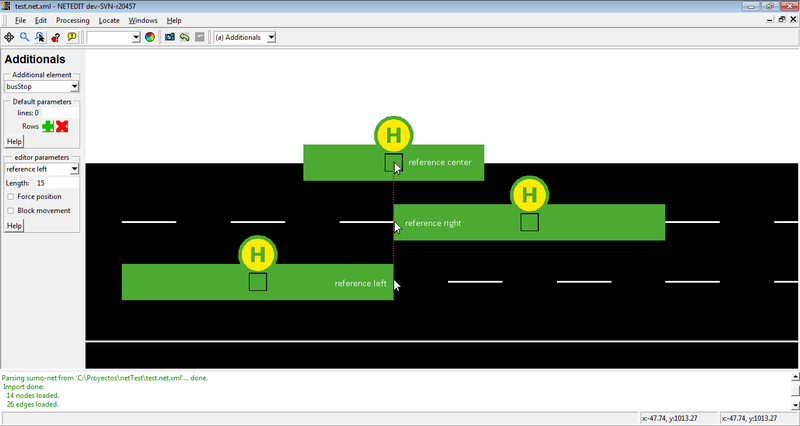 A calibrator generates a flow of vehicles during a certain time, and allows dynamic adaption of traffic flows and speeds. A calibrator can be used to modify a simulation scenario based on induction loop measurements. 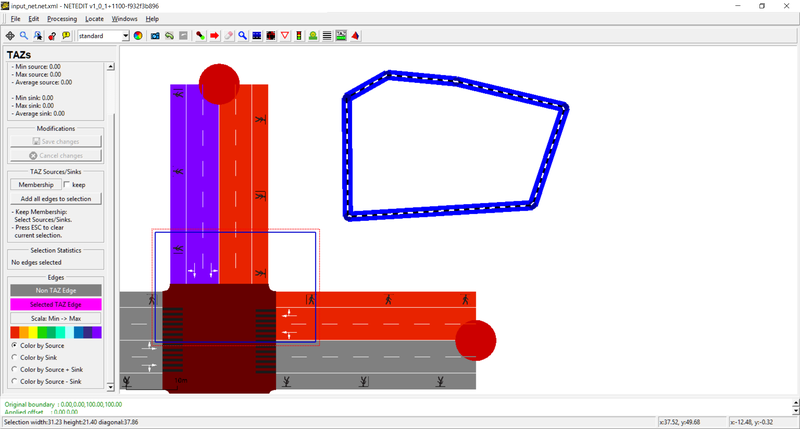 It will remove vehicles in excess of the specified flow and will insert new vehicles if the normal traffic demand of the simulation does not reach the specified number of vehsPerHour. Furthermore, the defined edge speed will be adjusted to the specified speed similar of the operation of a variable speed sign. Calibrators will also remove vehicles if the traffic on their lane is jammend beyond the specified flow and speed. This ensures that invalid jams do not grow upstream past a calibrator. 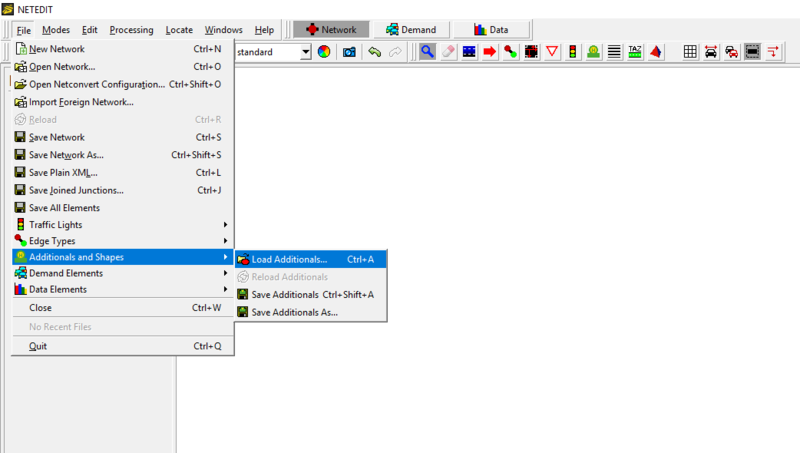 A double click over the calibrator icon opens the values editor. A rerouter changes the route of a vehicle as soon as the vehicle moves onto a specified edge. Rerouter is placed off the net. Double click open rerouter dialog. One click over '+' button open a dialog for adding a new interval. 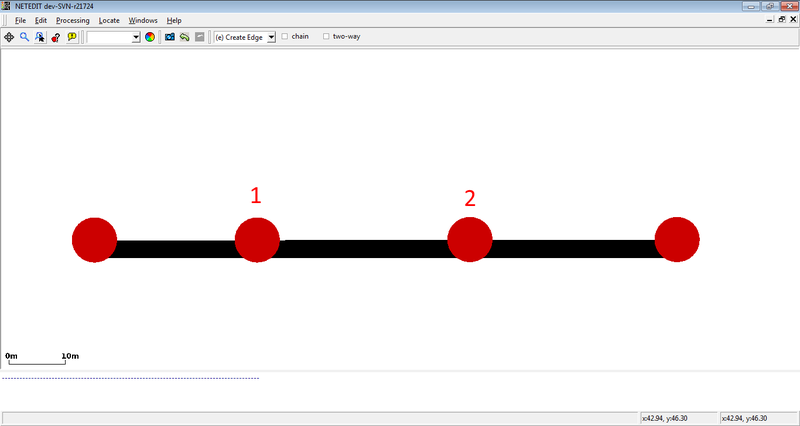 In interval dialog can be specified the four types of actions, as well as the begin and end of interval. If values of actions are invalid, a warning icon appears in every row. This can be applicable in begin and end of interval. A click over begin or end of interval opens the Rerouter interval dialog. In the same way, a click over "x" button removes the interval. vaporizers remove all vehicles as soon as they move onto a specified edge. Vaporizer placed over edge. Its placed always at the begins of edge. 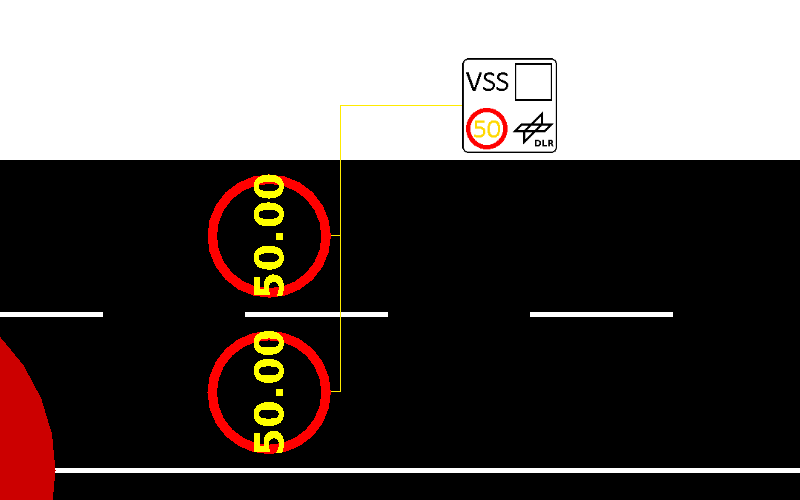 A Variable Speed Signal modifies the speed of a set of lanes during a certain time defined by user. A double click over the Variable Speed Signal icon opens the values editor. Split edge here: Split an edge into two differentes edges connected with a junction. Split edge in both directions here: Is similar to Split edge here, but generate splitted edges in both directions. Reverse edge: Reverse the direction of an edge. If the ID of the start and end junctions of edge are respectively A and B, afer this operation start and end junction will be B and A. 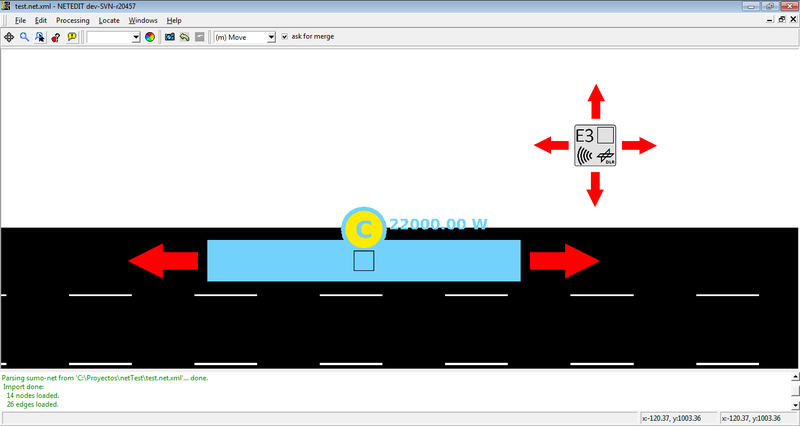 Restricted lanes for particulars vehicle class (VClass) can be easily added in inspect mode. 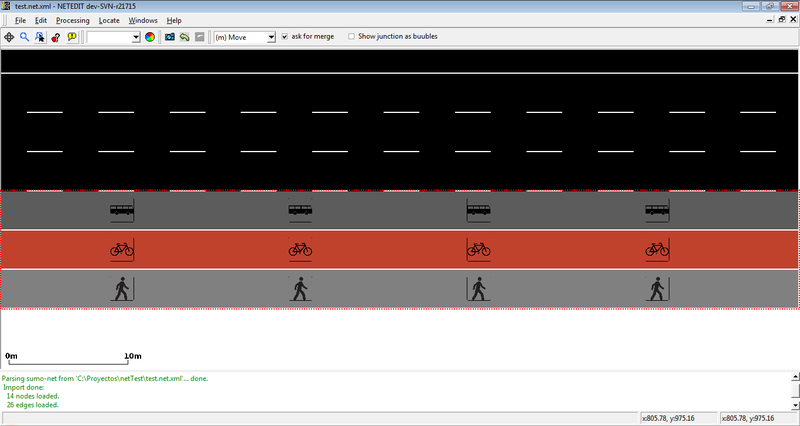 Currently netedit supports sidewalks (where only vehicles with VClass="pedestrian" are allowed), bike lanes (where only vehicles with VClass="bike" are allowed), and bus lanes (where only vehicle with VClass="bus" are allowed). 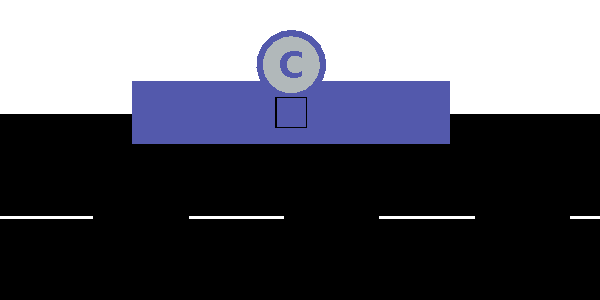 Note that only one type of restricted lane is allowed in every edge (For example, an edge can own two restricted lane, one for buses and another for bikes, but not two or more different restricted lanes for buses. 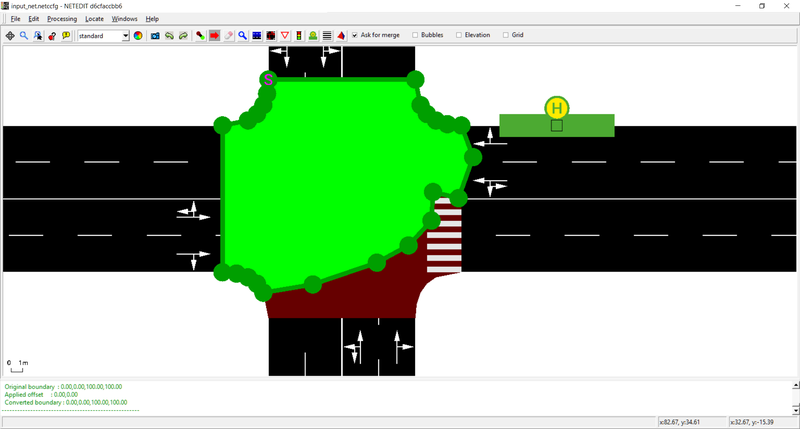 Adding a sidewalk using "add restricted lane"
Adding a sidewalk using "transform to special lane"
Set custom shape: Allows drawing a custom junction shape via a #Modifiable Poly (see below). The junction shape determines where the incoming edges end and the outgoing edges start. If the automatic generation of shapes does not give a satisfying result it often helps to draw a custom shape instead. The shape is a polygon defined by a sequence of (x,y,z) geometry points. Set custom shape: Allows drawing a custom connection shape via a #Modifiable Poly (see below). The shape is confirmed with <Enter>. 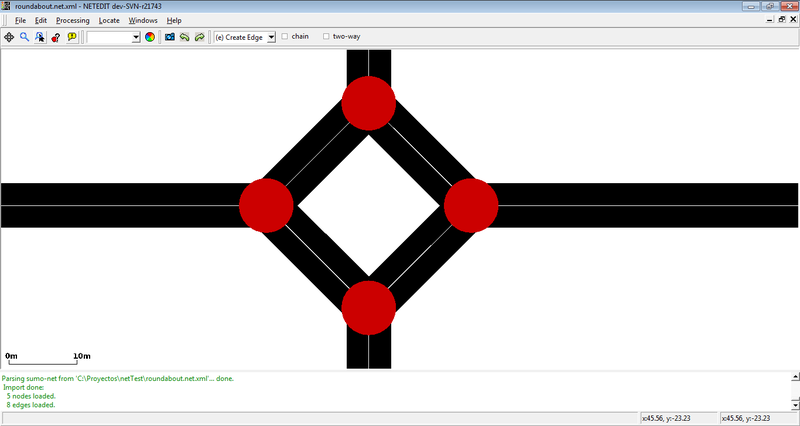 Set custom shape: Allows drawing a custom crossing shape via a #Modifiable Poly (see below). The shape is confirmed with <Enter>. The new shape is confirmed with the <Enter> key and discarded with <Esc>. 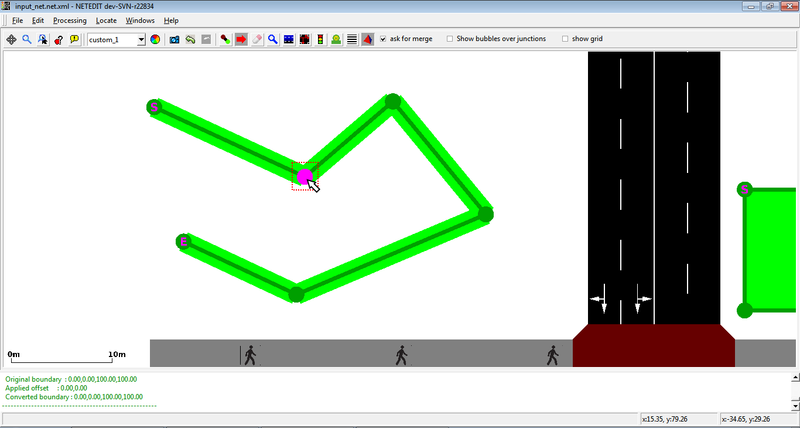 The green polygon outline allows adding and moving geometry points by left-clicking anywhere on the outline and dragging. 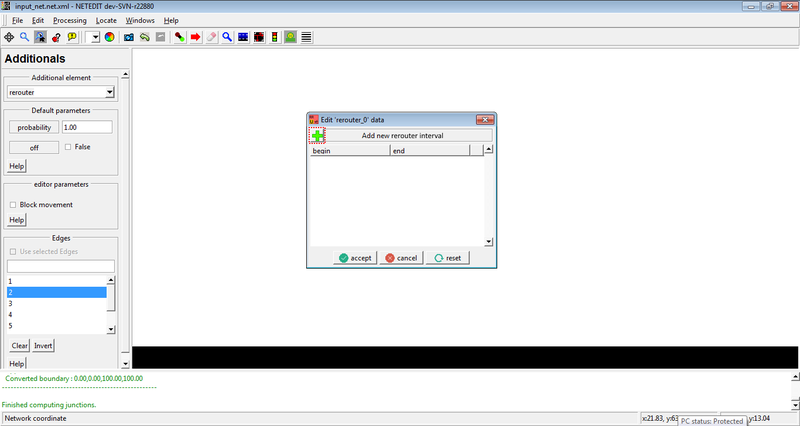 show parameters: show all parameters of additional. If the checkbox auto-select junctions is not set, and connections are not visible during the rectangle selection, all connections will be removed during the invert+delete steps. open the reduced network and load the original additional file. All objects outside the reduced network will be discarded with a warning. By default, the geometry of an edge starts with the position of the source junction and ends at the position of the destination junction. 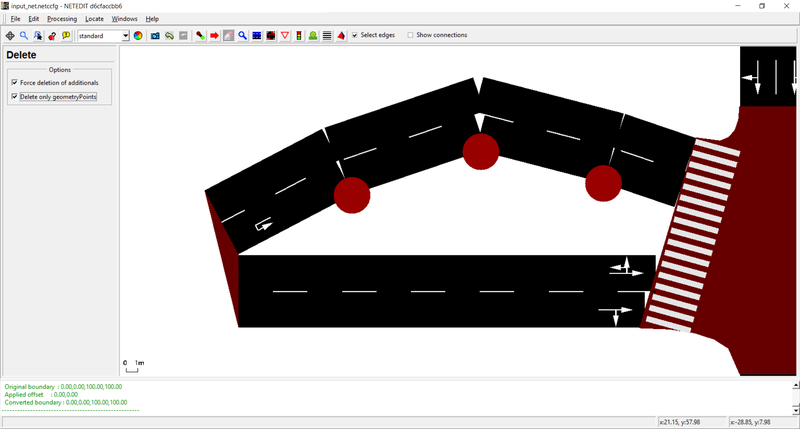 However, this sometimes leads to undesired junction shapes when dealing with roads that have a large green median strip or when modeling edges that meet at a sharp angle such as highway ramps. Also, when edges in opposite directions have unequal number of lanes (i.e. due to added left-turn lanes) and the road shapes do not line up. 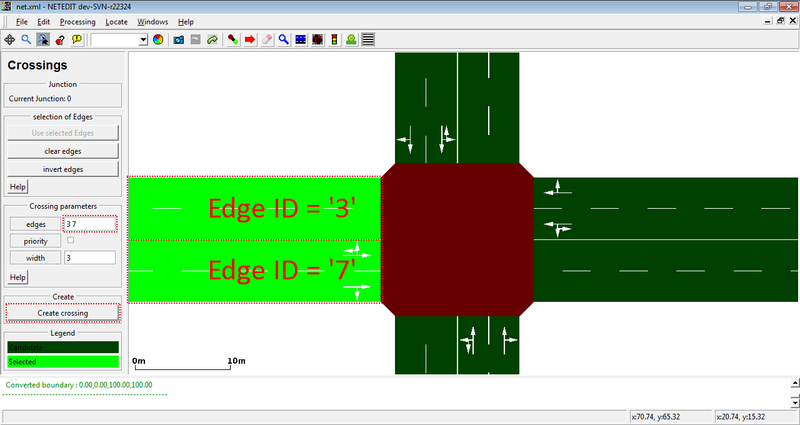 The solution is to define an edge geometry with custom endpoints. Below are three alternative methods of accomplishing this. shift-click near the start or the end of the edge to create/remove a custom geometry endpoint (marked with 'S' at the start and 'E' and the end. When right-clicking the geometry point the click must be within the edge shape for this too work. 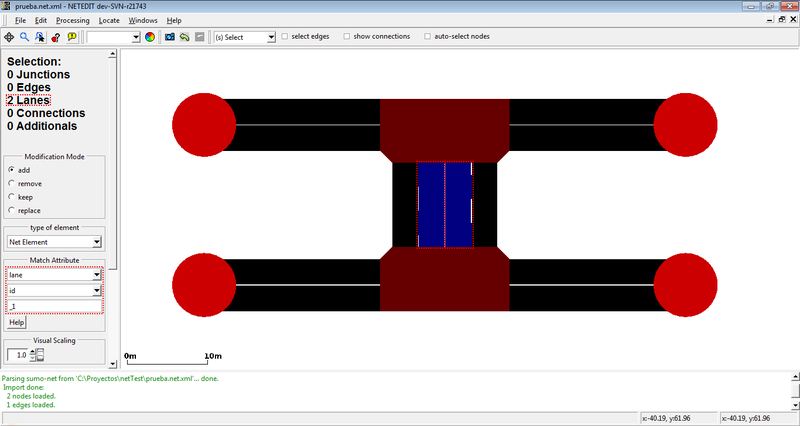 This will create a single joined junction but keep the endpoints at the original junction positions. We have a itersection(Junction) with four edges. Split edges in both direction in every edge to create new junctions. Intersection with the new junctions. Move shape of new edges to obtain a circular shape. 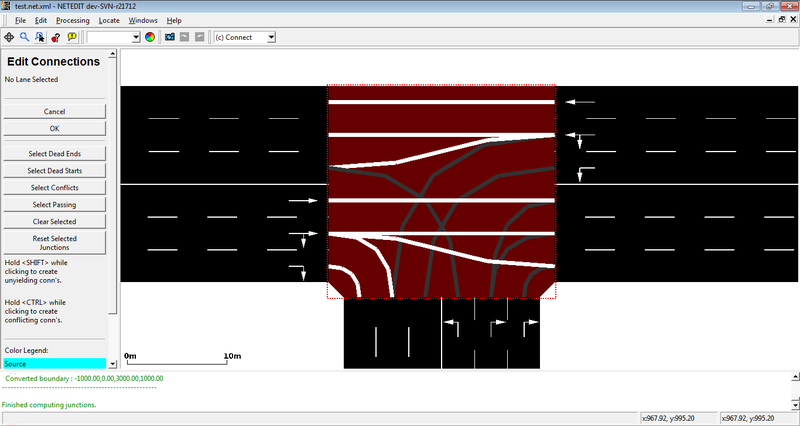 In this example we wish to modify a multi-modal road network (i.e. imported from OpenStreetMap) in the following way: All dedicated bus lanes should allow bicycle access. When setting coloring to by selection it may also help to modify transparency for selected or unselected edges. Using visualization options or attribute selection you can check whether an existing railway track can be used in both directions. set the edge attribute spreadType to the value center (in many cases this value is already set as it is the default value when importing tracks). Editing <neigh> information for Simulation/OppositeDirectionDriving. Currently, the only support is in switching on --opposites.guess via the F10-menu.